Have u ever been obsessed with anything? Something you can’t stop thinking about it. You see it everywhere even with your eyes closed. You dream of it when you fall asleep and still day dream about it when you are wide awake. Yes, that type of obsession and my current obsession is rolling Parathas. Not just plain parathas but some mean stuffed parathas. It feels good when you master (no place for modesty here ;) something which you thought to be impossible to make let alone master. No, actually it doesn’t feel good… It feels great! I can already visualise many of you shaking your head and some even banging it against the wall. I am very well aware of the fact that many of you skilfully roll hundreds of these stuffed parathas everyday with ease. I salute all you Aunties. ~ducks her head ;) ~ But it’s a different paratha story for me. I feel like a small baby who just learned to walk without any support and happened to be enjoying this new found freedom! After my successful attempt with Tofu, Aloo, Gobi, Mooli etc stuffing I wanted to make little different parathas. With little bit of googling (Long Live Google!!!) I came across very unusual recipe from none other than Indian cooking diva Mrs. Tarla Dalal’s blog. Although I don’t own even single book of hers (I really can’t call my single digit cook books as my cook book collection) and never cooked any of her recipes, I have had seen many of her creations being recreated and appreciated in blog world. More than everything what attracted me to this particular recipe of hers is the challenge involved! It was not some usual stuffed paratha. 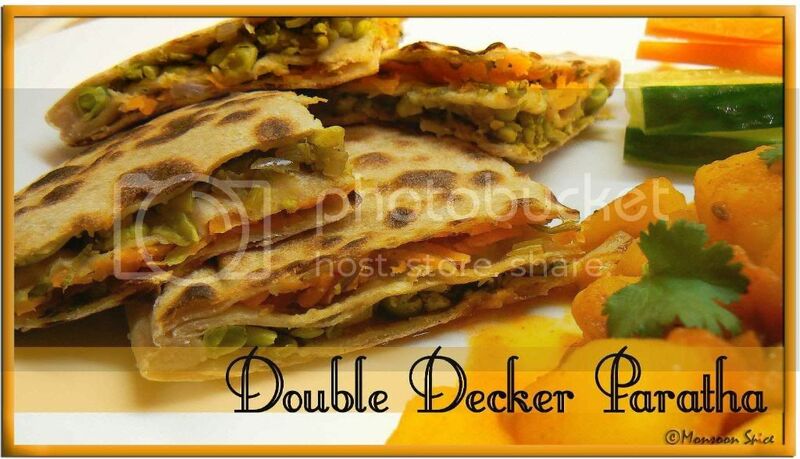 It was unique paratha which she calls Double Decker Paratha where two different fillings are used to create two layered paratha. One look at the recipe I knew I am not gonna rest until I make them. And that’s what exactly what I did on last weekend after postponing my spring shopping!!! For a shop-o-holic, I didn’t regret even for a moment to stay at home and create these babies. Although taste wise it might taste similar if you had to combine these two fillings and make just a usual stuffed parathas, it was gorgeous to look at. 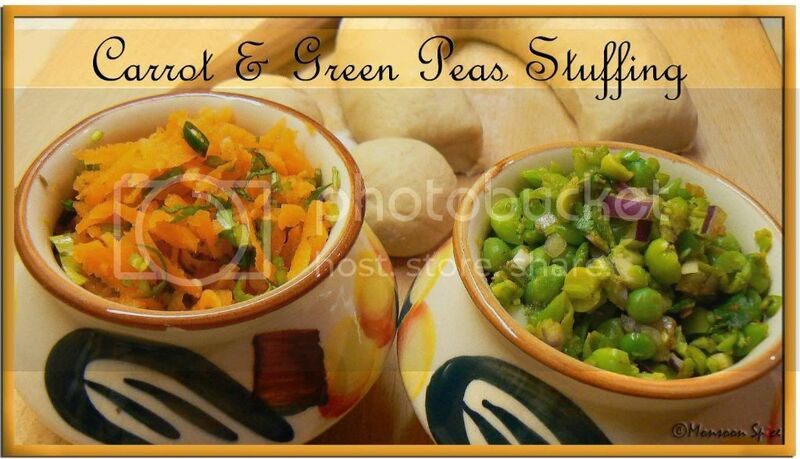 Two thin layers of parathas stuffed with crunchy carrots and sweet green peas were lovely to look at. For a foodie they were nothing less than a stunning piece of jewellery studded with corals and emeralds!!! Place atta, salt and warm water in a bowl and mix well to form smooth dough. Keep aside for at least 30 mins covered with a wet cheese cloth. Mix grated carrot with all the ingredients listed and keep it aside. Original recipe instructs to cook carrot for 2-3 minutes but I just mixed the raw ingredients to retain its colour and nutrition and also its crunch. And also it gets lightly cooked when you pan fry the Paratha over medium heat. So the choice is yours. Mix cooked and mashed green peas with all the ingredients listed and keep it aside. Again the original recipe instructs to cook the ingredients for few minutes. Heat the tawa/griddle at high flame and reduce to low to medium flame. Knead the dough for another minute or a two and divide it into 12 or 15 equal sized balls (for 4 or 5 Parathas respectively). Roll them into equal sized discs and cook 4 or 5 chapattis lightly (for 4 or 5 Parathas respectively) and keep aside. Let them cool completely before you proceed. Now place one uncooked chapatti on a surface and spread about 1 tbsp of carrot stuffing evenly leaving 1-1½ cms in the end. 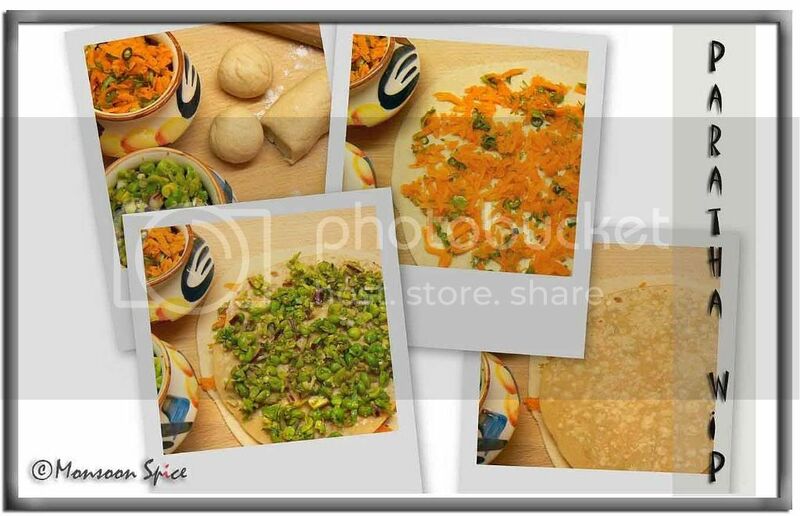 Cover this carrot stuffing with a cooked chapatti and spread 1 tbsp green peas stuffing evenly on top of this. Now place the second uncooked chapatti on top of this and seal the edges by pressing it lightly with your fingers. Make sure that you seal the edges well. Place this Double Decker Paratha on tawa and cook on a very low heat by applying little ghee/oil if desired. Cook till the both the sides are cooked well and brown spots starts to appear. Cut them into quarters and serve hot with a curry or just plain yogurt and enjoy. Make sure that the chapattis are completely cooled down before you proceed with assembling the paratha as if assembled when it is still warm may tear the uncooked paratha due to moisture produced. If you are a beginner, you can start off by making small parathas and not stuffing too much of filling. You can also cook these parathas in Quesadilla maker. Try using different ingredients for stuffing and follow the same technique to create different flavoured parathas. An Ode to Potato ends on 15th of March. Send in your entry before the deadline and join us in the singing. Bake, boil, mash, fry, sauté, grill, stuff, cook... The choice is endless. Wow I still have in my mind the other parathas you made and have bookmarked them to make and now you come out with another delicious looking parath which is a dubble decker. wow! what a delightful way of making parathas. Gosh, double decker, very innovative. Now, I know the level of obsession. In Taco Bell, a Mexican fast food restaurant here, make a similar dish called double decker Tacos. Trisha's favorite. They take a soft Tortilla, layer with cheese, layer it crispy Tortilla and stuff with meat, cheese and the usual salad. When you bite, you get the softness and the crunch and all that yummy stuffing with "fire" sauce.Delicious! Sia, Thats mighty creative. I know that addiction. I myself was addicted to all kinds of paratha a few months back. I think its the convenience of roti and subji is one package, that entices paratha making. I love it. Thanks dear. Wow! Those Parathas look so yummy! Now i'm bookmarking this recipe to try out someday. These Parathas look like a challenge to me, and i love to experiment in my kitchen. Thanks for sharing dear! Yupee.. first one to comment hey great and amazing phtos sia .. i didnt have my breakfast properly since i got up late can i grab someting.. lovely entry. Ohh wowww..they look so delicious Sia. I am going to try this soon. Hey its good so good that i felt like taking from monitor and want to have hot hmmmmmmm....yummy...mouthwatering!!!! Great ! this will be like two paratha's in one go in the mouth :) Nicely done. Wow that sounds great... Iam definely going to try this and have noted it down. I fell in love with it when i opened ur blog and with out even reading the contents , thought that it should be definitely tried .. looks awesome and thanks for sharing sia. Got back from India last week. It was an amazing trip. Great for M with all the attention she got. She revelled in it! Took a little stopover in UK too but I had forgotten to get your phone number from you. Would have liked to at least chat with you. Hope to blog about it all soon! Take care. Great dish there! Hi Sia, It looks lovely. Nice photographs. It's bookmarked. Sia..iam drooling here..iam also obsessed with paratha..
Wow, mouth-watering Parathas. Wonderful pics. I don't know how to knead flour into dough, let alone roll parathas! 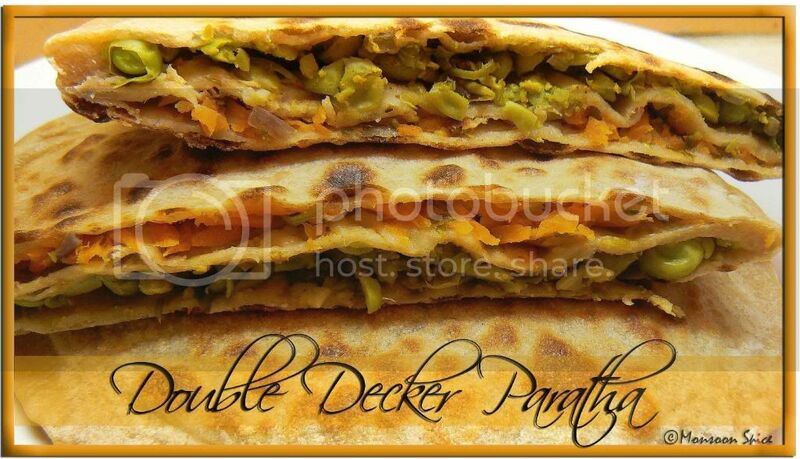 Oye Sups, aunty kiso bol rahi hai :-D.
Love the double decker paranthas! They would be so good for parties! Love your choice of vegetables, dear-these would go so well with each other! Must try! I can totally relate to foodie obsessions like yours :). And you are having them without me-not done, Sups :). Have my share too :). I'm nodding in agreement gal! I know how ya feel!!! Theres nothin like too much with yummy stuff!!! Oh those parathas look so yum and filling too! They are simply wonderful! !Am surely going to try this. Oh my God, you made me all nostalgic - I made these 10 years ago as a newly married bride with a new cookbook in her hand and a willing taster at the table ! I remember it's a filling recipe and tastes very good. Those parathas you have made look perfect! Def not an easy to make recipe!..Healthy too!!! hmmmm... I can see someone is following Trala Dalal's recipe and making dihses even great than mrs. Dalal :D.
this is a wonderful idea, looks so fresh and tempting , thank a lot for sharing buddy . Mouth watering. And because once is not enough, definitely, I will say it again. Mouthwatering. Fantasctic idea.Oh, I d love to bite into one right now. Can I have few..may 2..umm no 4 please..They are awesome Sia. Akash wanted me to make them. He was saying "mummy red n green chapathi..nange beeku"..I think I must make them soon. Sia, did you get my second entry for potato event? I have the Tarla Dalal book with this recipe, have made it and yes, it tastes great. I'm sure she would love to have your paratha picture in her book. They look wonderfully tempting. Sia, can u suggest something in place of green peas, which I'm not a big fan of. use mooli/radish or gobi/cauliflower or paneer or tofu... there are many options. Oh my god!!! That's a really mean paratha!!! This one is too good! Looks picture-perfect and have no doubts at all it is very delicious!